Also known as far sightedness, is the condition in which a person can see distant objects better than closer objects. 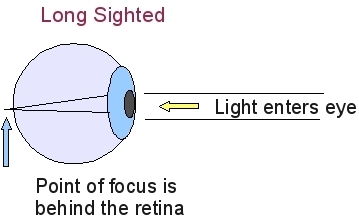 Light being bent inwards by the lens is insufficiently bent and converges at a point behind the retina. This is illustrated by the image below, note the light rays converge behind the retina. To focus the convergence point correctly on the retina, the lens would need to pull in and become more convex. Generally far sightedness occurs when the eye ball is somewhat small or short, causing the light to focus behind the retina. Or alternatively it could be described as the lens not contracting enough to focus the light correctly. As with shortsightedness there are often genetic factors at play. There are many similarities between presbyopia and hyperopia in that both are “far sighted”. Hyperopia describes far sightedness when the problem is associated with eye ball size issues. Presbyopia describes far sightedness when the problem is caused specifically by a weakening and stiffening of the lens system. The generally accepted treatment is glasses or lenses. Eye exercises are considered by many to be of value, particularly in less severe cases. Eye exercises which re-train the visual system and brain patterns associated with convergence and accommodation can be highly effective. The exercises also need to improve lens flexibility and control.